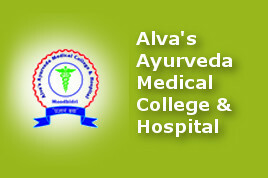 Alvas Ayurveda Medical College & Hospital : Vydya Health - Find Providers, Products. Alvas Ayurveda Medical College & Hospital is one of the most affordable places to find the best care. Following charges are effective as of 01-Jul-2015 (All charges are in Indian Rupees (INR, symbol: ₹)). Note: The above charges are as provided by the Alvas Ayurveda Medical College & Hospital as of 27-Nov-2015. In case there are differences between these and their current charges, their current charges hold good.